Bathe in the lap of luxury every morning with some of nature's finest ingredients. 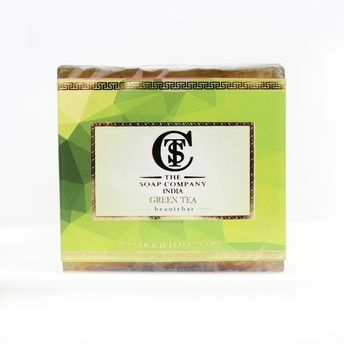 The Soap Company Handcrafted Luxury Green Tea Soap is an incomparably exquisite beauty bar is enriched with moisturizing vitamin E oil, Almond oil, Green Tea petals to rejuvenate dehydrated skin & protect against UVA & UVB damage. It will also delicately scent your skin whilst you shower.